Today, as I write this post, many in the United States are returning from their excursions into the shopping malls and plazas this Black Friday, reviewing their treasures and perhaps licking their wounds. However, here in Mexico, it’s a Friday like any other, except perhaps for the 4,000+ delegates of the 51st General Council who today head home after a week full of praise, prayer, preaching, and important business. It’s my pleasure to let you know that, although we’re a bit worse for the wear after the long days and short nights, we are pleased with the results and thankful for your prayers throughout this week. From the start to the finish of the Council, we were reminded of our dependence on the Presence of God. Daniel de los Reyes, our current General Superintendent, opened the council quoting the words of Moses in Exodus 33:15 “Then Moses said to him, “If your Presence does not go with us, do not send us up from here.” Elizabeth Jimenez de Chavez, a pastor in Ciudad Juarez, known as the most violent city in the world because of the war on drugs, reminded us that in spite of the current situation that God was with us “to the end of the age.” The council also heard from Butch Frey, our former Area Director, as he encouraged us with words from the Prodigal Son that no matter where we are we can always go home. Elections were held for the General Superintendent, the General Secretary, and the General Treasurer. Because of term limits, Daniel de los Reyes was prohibited from seeking another term as General Superintendent. On the third day of the council, Abel Flores was elected as General Superintendent on the fourth ballot. The current Adjunct Superintendent of the Central Zone, he has been regarded as a man of vision and integrity and the news of his election has been favorably received by ministers and missionaries alike. In the afternoon of the same day, we returned in order to select the General Secretary. After the third round of voting, Juan Perez, the current Adjunct Superintendent of the Southern Zone had a clear majority over Daniel de los Reyes although an election could not be declared. However, Daniel de los Reyes, feeling the direction of the council, withdrew his name allowing Juan Perez to be declared the new General Secretary. He succeeds the current General Secretary, Samuel Vázquez. On Thursday morning the final election was held for General Treasurer. In this election, it was the current General Treasurer, Guillermo Rodríguez, who stepped aside, this time for Daniel de los Reyes, as he was declared the General Treasurer Elect according to the wishes of the Council. The change of the Society of University Students, Professionals and Businessmen, the Society of Royal Rangers, the Society of Missionettes, and the Society of Children’s Ministries from the classification of society as to the classification of official national ministries. The creation of the program, “Missions without Borders,” a Mexican version of “Speed the Light,” a program created to buy communication equipment and vehicles for nationally appointed missionaries. So as you head yet again to those Thanksgiving leftovers, we want to thank one more time for your prayers throughout this week. 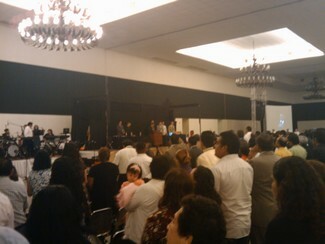 We appreciate your continued interest and support of what God is doing here in Mexico.